This pair of weld-on slotted tabs are perfect for custom projects. It is designed to be welded onto any flat surface and can be used with any of our LED light bar products. These tabs ship unfinished and ready to weld. This brow mount kit from Rigid Industries is designed to be mounted just above the windshield on Spartan fire engines, but can be used for many applications. It accepts either a single E-Series light bar or two SR-Series light bars. Its stainless steel construction and durable white powder coat finish ensure years of trouble free usage. Rigid Lights are now mountable for directional lighting! The Radius Mount Kit allows for a movable light beam wherever you need it! For those vehicles that simply can’t handle the amazing mounting options we have available for our LED Lights. Rigid has thought of the perfect solution: License Plate Mounts! These Durable steel plates have a black polyester based power coat and can mount 2 SRMs, SRQ’s, or Dually’s! This universal Suction Cup Mount Kit is the perfect solution for the enthusiast that needs to be able to use their lights for multiple applications. The built-in suction cups have a strong hold and can be used in all weather. The included wire harness plugs into your 12v power source (cigarette lighter) and powers up to two lights. The mount accepts either a single SR-Q or a pair of SR-M LED lights. Its stainless steel construction and durable powder coat finish ensure years of trouble free usage. This kit is backed by a limited lifetime warranty. 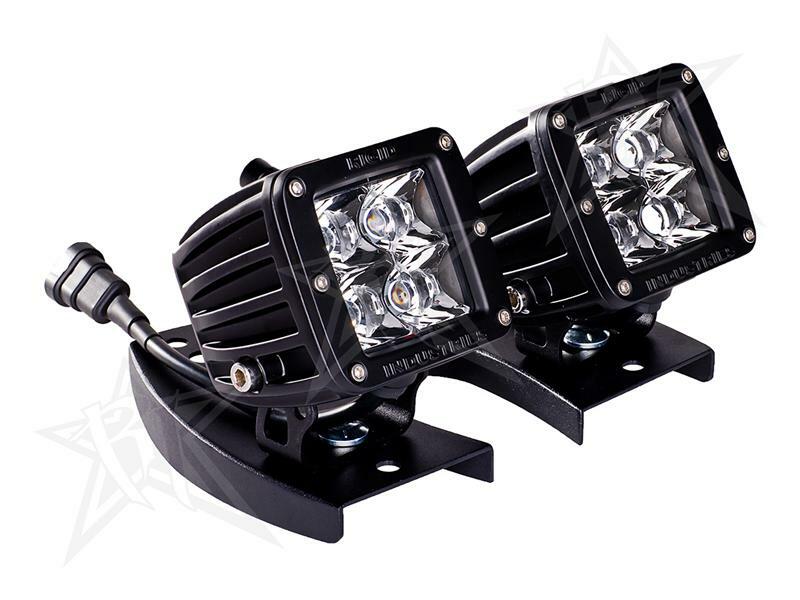 The cradle mount is specifically designed to be used with Rigid LED light bars. It is made right here in the USA out of high quality stainless steel and powder-coated satin black to match Rigid Industries lighting components. This ATV Handlebar Mount allows you to use Rigid Industries’ performance LED lighting components as a headlight on your ATV. Constructed from quality stainless steel and powder-coated black, it is simple to install and bolts on in minutes. This ATV Handlebar Mount moves with the handlebars and projects the light into the turn where you need it.